FALLSBURG, NY (January 22, 2014) – For the past seven years, the Town of Fallsburg Lions Club has been testing children at Sullivan County Head Start for six different eye disorders. Known nationally as the SEE Program or Screening Eyes Early, International Lions Club has offered this quality of life changing service throughout the world. With parent’s consent, children under six years of age receive free vision testing and a digital readout for near and far-sightedness, astigmatism, unequal refractive power, childhood cataracts, and amblyopia or lazy eye syndrome. When discovered before age six, many of these disorders are easily correctible. 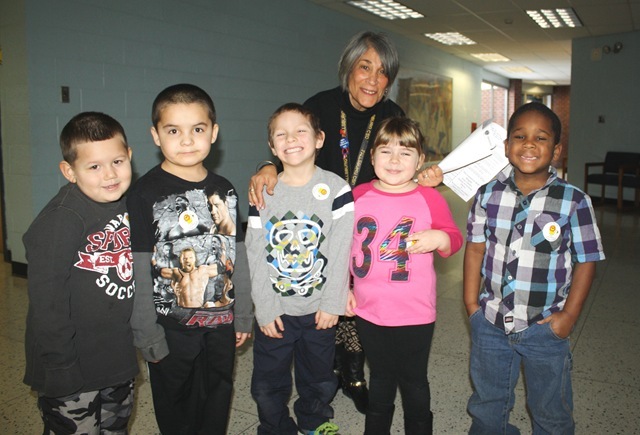 In recent months the Fallsburg Lions Club President Patricia Behan approached Fallsburg Superintendent of Schools and Fellow Lion Dr. Ivan Katz about extending the screening service to Fallsburg’s Benjamin Cosor Elementary School in their pre-K and kindergarten classes. After consultation with Principal Mary Kate Stinehour and School Nurse Merrian Hobby, the school District obtained consent forms from thirty-five parents to have their children screened. The Lions Team included Loretta Speckhardt, Bob Longo, Stephen Miller, Larry Schafman, Ilene and Stuart Wizwer. Digital readings are forwarded to the Ira G. Ross Eye Institute in Buffalo. Results for referrals will go directly to the parents. The intention for this program is to provide parent consent forms to the school staff during registration for pre-K and kindergarten classes during the summer so screenings can occur every September or October. If you would like to learn more about this special SEE Program and other Lions Club activities, please contact Stuart Wizwer at 845-434-2152.